Dr. Kian was great. He explained everything perfectly. Everyone in the office was friendly. I was able to get an appointmenton the same day!! Dr. Kian is a fellow of the american Academy of Ophthalmology and the American medical Association. 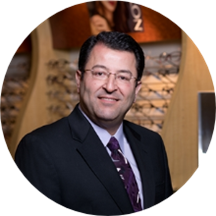 Having been in the valley since 1994, he proud to have established the Advanced Laser and Eye Center to better serve his patients in the Southeast Valley. He completed his medical education at the University of Texas Health Science Center in San Antonio, where he graduated with honors and was involved in teaching other students and preparing lecture material. after completing his internship at Brackenridge Hospital in Austin, TX, he completed his Ophthalmology training at Louisiana State University Medical Center. He developed a special interest and expertise in the fields of glaucoma and refractive surgery. He also did research on corneal topography and its role in refractive surgery. Since then he has attended several major courses and seminars in continuing medical education in the fields of laser refractive surgery and cosmetic skin resurfacing.